A votive sculpture found near the Varvakeion school reflects the type of the restored Athena Parthenos: Roman period, 2nd century CE (National Archaeological Museum of Athens). Athena Parthenos (Ancient Greek: Ἀθηνᾶ Παρθένος; literally, "Athena the Virgin") is a lost massive chryselephantine (gold and ivory) sculpture of the Greek goddess Athena, made by Phidias and his assistants and housed in the Parthenon in Athens. Its epithet was an essential character of the goddess herself. A number of replicas and works inspired by it, both ancient and modern, have been made. It was the most renowned cult image of Athens,[note 1] considered one of the greatest achievements of the most acclaimed sculptor of ancient Greece. Phidias began his work around 447 BC. [note 2] Lachares removed the gold sheets in 296 BC to pay his troops, and the bronze replacements for them were probably gilded thereafter; it was damaged by a fire about 165 BC but repaired. It continued to stand in the Parthenon in the 5th century AD, when it was removed by the Romans. An account mentions it in Constantinople in the 10th century. ...The statue is created with ivory and gold. On the middle of her helmet is likeness of the Sphinx ... and on either side of the helmet are griffins in relief. ... The statue of Athena is upright, with a tunic reaching to the feet, and on her breast the head of Medusa is worked in ivory. She holds a statue of Victory that is approx. Four cubits high, and in the other hand a spear; at her feet lies a shield and near the spear is a serpent. This serpent would be Erichthonius. On the pedestal is the birth of Pandora in relief. The general appearance of the Athena Parthenos, although not its characteristics and quality, can be assessed from its image on coins from its reproductions as miniature sculptures, as votive objects, and in representations on engraved gems. Athena's head is inclined slightly forward. She stands with her left hand resting on an upright shield. Her left knee is slightly bent, her weight slightly shifted to her right leg. Her peplos is cinched at the waist by a pair of serpents, whose tails entwine at the back. Locks of hair trail onto the goddess's breastplate. The Nike on her outstretched right hand is winged; whether there was a support under it in Phidias' original has been much discussed; evidence in surviving versions is contradictory. The exact position of a spear, often omitted, is also not fully determined, whether held in the crook of Athena's right arm or supported by one of the snakes in the aegis, as N. Leipen restores it, following the "Aspasios" gem. The sculpture was assembled on a wooden core, covered with shaped bronze plates covered in turn with removable gold plates, save for the ivory surfaces of the goddess's face and arms; the gold weighed 44 talents, the equivalent of about 1,100 kilograms (2,400 lb); the Athena Parthenos embodied a sizeable part of the treasury of Athens. 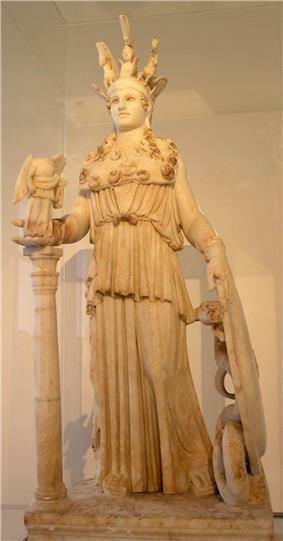 The Varvakeion Athena is one of the two ancient versions of Athena Parthenos considered most faithful to the original; the other is the uncompleted Lenormant Athena, also in the National Museum, Athens. The Varvakeion Athena, a 2nd-century CE Roman copy in marble is housed in the National Archaeological Museum of Athens. The Lenormant Athena, uncompleted, of the 2nd to 3rd century, also in the National Museum, Athens. Another copy is housed in the Louvre. Another copy is in the Museo Nazionale Romano in Rome. A 3rd-century BC Roman marble reduced-scale copy of the statue's shield, from the Strangford Collection, is conserved at the British Museum. A modern copy by Alan LeQuire stands in the reproduction of the Parthenon in Nashville, Tennessee. LeQuire, a Nashville native, was awarded the commission to produce the Parthenon's cult statue. His work was modeled on descriptions given of the original. The modern version took eight years to complete, and was unveiled to the public on May 20, 1990. 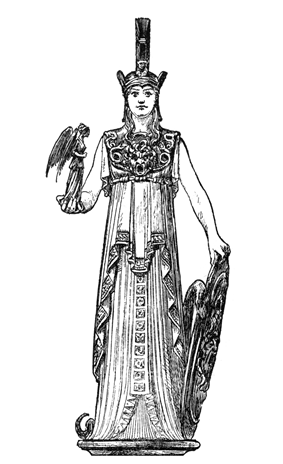 The modern version of Athena Parthenos is significant because of its scale and its attention to recreating Phidias' work. The statue adds an additional dimension of realism to the replicated Parthenon, whose interior east room (the naos) was merely a large empty hall prior to the statue's unveiling. The reproduced Athena Parthenos gives visitors the impression that they truly are inside an ancient place of worship. The Nashville Athena Parthenos is made of a composite of gypsum cement and ground fiberglass. The head of Athena was assembled over an aluminum armature, and the lower part was made in steel. The four ten-inch H beams rest on a concrete structure that extends through the Parthenon floor and basement down to bedrock, to support the great weight of the statue. LeQuire made each of the 180 cast gypsum panels used to create the statue light enough to be lifted by one person and attached to the steel armature. Nashville's Athena stands 41 ft 10 in (502 inches (12.8 m)) tall, making her the largest piece of indoor sculpture in the Western World. Sculptor Alan LeQuire painting the detail of the Athena Parthenos replica during the gilding phase. Research was performed by LeQuire and the Parthenon staff to ensure the accuracy of the statue's resemblance to the Phidias work. It stood in Nashville’s Parthenon as a plain, white statue for twelve years. 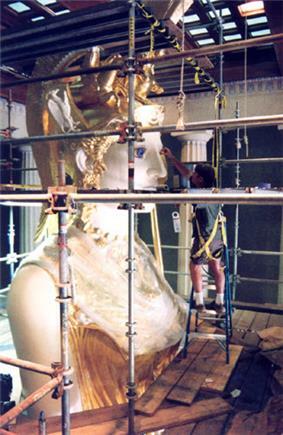 In 2002, Parthenon volunteers gilded Athena under the supervision of master gilder Lou Reed. The gilding project took less than four months and makes the modern statue appear that much more like the way that Phidias' Athena Parthenos would have appeared during its time. The gold plates on the Athena statue in ancient times weighed approximately 1,500 pounds (680 kg) and were one-sixteenth to one-eighth of an inch (1.6 to 3.2 mm) thick. The 23.75-karat gold leaf on Nashville's Athena Parthenos weighs a total of 8.5 pounds (3.9 kg) and is one-third the thickness of tissue paper. The modern extravagance of gilding such a large statue pales in comparison to the lavish spending of the Greeks. The Athena Parthenos plays a major role in Rick Riordan's Heroes of Olympus series, first featured in the third installment The Mark of Athena and is also featured in the succeeding books of the same. It is represented as the cause for continuing hostilities between the Greeks and Romans. Its return is the only thing that can prevent another civil war. ^ The Athena Parthenos was featured on contemporary reliefs commemorating Athenian treaties and for the next century and a half on coins of Hellenistic monarchs avid to proclaim their Hellenic connections, see Hector Williams, "An Athena Parthenos from Cilicia" Anatolian Studies 27 (1977, pp. 105-110), p 108f. ^ Andrew Stewart gives 446. ^ Gisela Richter, Sculpture and Sculptors of the Greeks, p 220 with ancient references, noted by Gorham P. Stevens, "Concerning the Parthenos" Hesperia 30.1 (January 1961, pp. 1-7) p. 2. ^ Pausanias, Description of ancient Greece, Book I, 24.5–7. ^ L. Lacroix Les reproductions des statues sur les monnaies gracques (Liège) 1949, pp 266-81. ^ Gisela Richter decided there was not and summarized the discussion in "Was there a vertical support under the Nike of the Athena Parthenos?" Studi in onore... Calderini e Paribeni (Milan) 1956, pp 147-54. ^ "Louvre Museum Official Website". Cartelen.louvre.fr. Retrieved 2015-09-05. 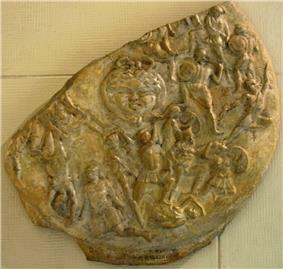 ^ "Fragment of a marble shield". British Museum. 2015-03-20. Retrieved 2015-09-05.